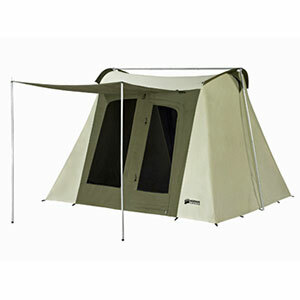 Bulletproof expedition grade tent at home in severe weather or just for a family outing. I bought this tent used after returning to the world of backpacking following a too-long hiatus. I'd spent too many cold nights in a three-season tent where the wind howled through the bug netting sides and decided that I needed a good four-season tent. Given the prices, however, I spent a lot of time researching until I finally decided on the K2-XT. Although I don't need an expedition grade tent it has come in handy. A surprise overnight snow fall of 12" of the Adirondacks' finest heavy wet stuff didn't even phase this tent. Other tents collapsed during the night but we never even knew it snowed until the next morning. Setting up this tent is easy. I can do it by myself, but is it easier with another person (like my 11 year-old son). It pitches very tightly and really doesn't require the guy lines unless you're expecting some weather. I love the two vestibules, especially when there are three of us (or two and a large dog), giving a decent amount of room for gear storage. There are also several pockets to store gear inside the tent and an optional hanging shelf (which I didn't buy). I use the center ring to hang a small lantern. Over the years Eureka! has improved this tent's ventilation. It has always had hi-lo venting but earlier models didn't have enough fly venting so there were still condensation issues in cold weather. They also changed the location of the vestibule pole from inside using a sleeve to outside with clips. Perhaps the real downfall to this tent is its packed size and weight. With poles, stakes, and a footprint you're tipping the scales at around 11.75lbs in a 8"x24" stuff sack. That said you're also paying for (and carrying) doors, windows, and vents with massive solid zippers and no-see'um screens. They've basically thought of everything and the weight adds up. I put the whole shooting match on the top of my (external frame) pack and don't mind it too much. I picked up a second stuff sack and carry the tent body in one, the fly, poles, stakes, and footprint in the other when I feel like passing off some of the weight. All around I love this tent. I've spent more time using it in subfreezing or otherwise inclement weather than warm sunshine (not by choice), but that's what it's made for. It does breathe nicely in warm weather too. I'd buy another in a heartbeat! Welcome to Trailspace, dgdubya. Thanks for sharing such a helpful review of your Eureka tent. I'd love to see some pictures of yours, if you're willing to add them to your review. Since writing my review, I've sold my old K2-XT and bought a new one. The old one was the previous model. Love the new one even more--less condensation, better guy line system. Guess that's a positive recommendation. Thanks for the update, dgdubya. If you're so inclined, you can edit/update your review to reflect that new info. Great all around tent, in wind and rain. I've had this tent going on 20 years, mostly used in canoeing. A little heavy for backpacking, but the comforts outweigh that issue. Great hi-lo ventilation, very little condensation inside. Never had an issue with rain getting inside wet. I have always loved tents, had several including a close Sir Edmund Hillary, but this is my favourite. Camping here in Newfoundland, Canada, can bring all four seasons in one day, and the Eureka K-2 XT can handle it. Thanks for posting, Nelson. I'd love to see some pics of your tent. I have owned a K2-XT for 6 years, and use it for everything from winter camping to my home when on the road as a construction manager. Staying at campsites close to the construction site has saved me time and money as well as satisfying my need to be outdoors. I have been a Master Maine Guide for 30+ years and have never had a better tent. 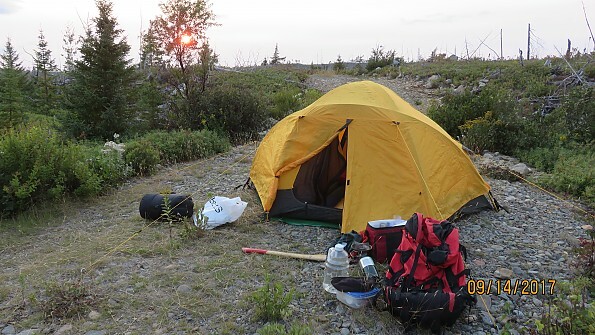 The tent has more than ample room for one man and all his gear and will comfortably serve two adults and all their necessary and unnecessary “stuff”. When winter camping the tent is pulled on the pulk and is kept extremely warm with a Coleman two mantle lantern, at -25 below with the lantern on med, resting on a block of wood in the vestibule, it was toasty enough to strip down to the poly-pro and Smart-Wool socks. This truly is a wind-proof tent, during a late winter ice storm with winds of 35mph and gusts to 50mph, the tent started to buzz and vibrate but after finding equilibrium I could hardly hear the wind at all. I purchased the tent in Connecticut as a floor sample in mint condition for $126. It was on display for view only above the sales floor and I was the first one to set foot in it. I would buy one again in a heart-beat. This review is for the 2008 model. Awesome tent! Very sturdy in high winds, absolutely HUGE inside. Definitely better off as a 3-person tent, especially in winter, to conserve some heat. Great ventilation, easy and straightforward set-up. A little bit heavy, but only when comparing it to much smaller tents. The weight is comparable to other similar sized tents (despite being rated a 2-3 person tent, it really is way too big for 2 people). Good value, comparable to North Face VE25 at a much cheaper price. Wow! This tent is a palace for 2-3 people in any weather. Wow! This tent is a palace for 2-3 people in any weather. Fairly easy setup, just recommend practicing once or twice in your yard before attempting setup in inclement weather/low light. Guyouts are located extremely well and provide an ultra rigid structure when finished. I was absolutely stunned when I first opened this baby up and saw all the luxuries this tent had to offer: 1) Multiple gear stowage in front and rear vestibules, side pockets, and loft (if purchased), including many options for a bit of personal gear. 2) Huge front tubular vestibule with rainproof window and separate vent allows for foul weather cooking- this happened to me at least twice, and I loved the chance to eat hot food without getting wet. 3) Way more venting options than anyone will ever need- this includes Eureka's hi/lo zipper use on doors, along with zippered vents in inner ceiling and side walls. Yes, the tent is heavy, but split the weight up with your mates and you'll be the envy of the woods. I highly recommend considering this tent for a serious 4 season shelter at a price point that can't be beat. I have taken it up into the country 7 times now and have yet to be dissappointed, it is extremely warm, I have never had any condesation build up(though AZ is fairly dry), no workmanship issues and so forth, if this tent is stolen or lost I will get an exact replacement. My only complaints are the overall size of the tent when bagged and weight. I do a lot of solo camping so adding 11 lbs to my pack plus the rest of the gear is quite fatiging. I suppose if you can divy up supplies then this would be a great tent for back packing, but solo backpacking it is not. As far as condensation is concerned, I got stuck in a monsoon storm in Strawberry AZ in August of this year, and had to setup camp in a terrible down pour, there was at least 3 inches of water inside of the tent at the entrance going back about 4 feet. After I got it setup and I could feel my fingers again, I lit up my Coleman tent heater(which I almost left home) and setup the fire after the rain stopped, got in the tent an hour later and my bag, pack, ect were all dry. Turned off the heater and slept on top of my crappy SlumberJack bag, like a baby. Meanwhile my friends froze that night in their Walmart tents that setup before the rain. If you are in the market for a four-season tent, this a great buy. This tent is the bomb! I have taken it up to Zion in Utah several times in the late fall and it performed flawlessly. Something about camping at that time of year assures you that you will not be pestered by the summer crowds. The thing is incredibly solid...with 30 mph winds, it did not cause so much as a ripple. Lots of room inside which I love and it holds the heat in beautifully. I use a tent heater and a brunton Liberty lantern and it is cozier than my bedroom! Eureka put tons of vents on the interior so you can adjust venhilation as needed but the only time I was cold was when I had to go outside to answer the call of nature. Do yourself a favor and get one of these if you need a super strong, weatherproof, bombproof tent that will stand up to the worst mother nature can dish out. It is a little on the heavy side at 11 lbs but well worth the weight in poor weather. Ease of Setup: Average setup for 4-season tent. This tent is a great 4-season tent. It is like a VE-25 on steroids. 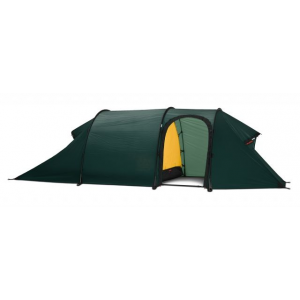 It is larger, the poles are larger, the tent and fly-material feel very substantial. New style has great venting options. I purchased mine to take my wife and 1-year old car-camping in Sequoia/Kings in November. It got cold at night, down to the upper 30's and it slept fairly warm. Although I purchased it for family camping in off-seasons, this is a more serious tent than that. I have been backpacking for 15 years and have spent many week-long trips in the high country (Sierras, Rockies, etc). I would say this tent easily compares to my Marmot Bastille. In fact, I would say that for sheer ruggedness and stability, it bests the Bastille. Trouble is it's a little heavy. Three guys would be cozy in this tent, but there's more space than a VE-25. The vestibule is pretty big, but you'll still have to crouch way down if you want to use it as an airlock. two-doors, w/mini vestibule in rear. Cabela's has an olive-green version if you don't like screaming yellow (I would have rather had the green). Ease of Setup: EZ to set up all poles are the same length. Weight: 12 a bit heavy and bulky for hiking but between 2 people not bad. I just took this tent to northern WI for a weekend trip. It rained... then froze to about 10F with 20mph wind... then snowed inches... turning back to rain and melting all the snow around the tent then back to snow freeze... back to rain. It was not good weather but the trip was great. All my gear stayed DRY. The tent stayed dry not a drop of condensation not a leak in a seam. Great Tent. A ton of room for two. Others in the group had lesser but good tents and suffered badly getting drenched with freezing water. EZ setup and even better breakdown. Great tent! I stayed warm and dry with all the comfort in the world. Durable and solid winter tent. I have had this tent for about 10 years now. It is still going strong—lots of pros like good ventilation for winter camping and a bomb proof setup. Dual vestibules is nice. The only drawback is that at 12 lbs I think there are a few ways they could have saved on the weight. Hard wearing, comfy, and warm. Bought this tent in 2010. It's really easy to set up and I've used it at very rainy events here in the UK, in really cold weather, in the desert in Africa, and it's always been comfortable, warm, and secure. Tengo el producto hace 6 anos aprox y lo he utiliado unas 10 veces, en la última note que la tela de sobretecho se deteriora, no se si es una falla de fábrica, o quedó con humedad en algunas de las salidas. I've had the product about 6 years and have widely used it about 10 times in the last year. Note the rainfly fabric deteriorates; don't know if it's a factory fault, or was moisture in some of the exits. Can someone help me? Is there is a cleaning process that can reverse the impairment? 4-season tent for sure, not a 4-person; unless you are a vertically challenged. Alaska winters and summers have put this through the ringer. Great tent, did awesome under 16 inches of snow dropped in under 12 hrs. Get some! A great tent for 2+ a large dog. I use it for winter pulk trips and it's a palace... With the amount of venting options we also use it for car camping the 3 other seasons. I made my own footprint but wish Eureka would sell a fitted nylon f/p's for their tents (hint, hint). It is heavy,hence the pulk, But has served me well for 4 years. I bought it from a ebay store($225) some 3+ years ago and still worth the $350+ they ask for it. A great tent. Took a 2004 model of this tent to Aconcagua in 2005/06. Took a 2004 model of this tent to Aconcagua in 2005/06. The 2004 has much less mesh than the newer design but we had little in the way of condensation buildup. We spent four nights at over 19,000 feet and were stuck in 100 mph winds for over 30 hours straight with no let up. The tent was fantastic only breaking two guy lines that we replaced with 4mm cord (the factory cords are too thin for a big mountain). 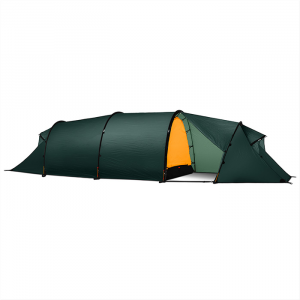 Would recommend this tent to anyone looking for a sturdy 4-season expedition tent. A bit heavy but very roomy inside for two people and gear on an expedition. Don't be discouraged by the thin poles (8.5mm) as they are designed to bend in high winds. I have had my K2 XT now for three years. Excellent product, although a bit of a challenge to get the poles into the grommets for a tight setup. I took it out elk hunting this last month 22*F at 0330 in the morning, but was not uncomfortable. Some condensation built up along the bottom of the floor walls. I utilize a Coleman Tent Heater for about 10 min. when getting ready to turn in. The tent holds the heat well for almost 40 min., plenty of time to get to sawing logs. Plenty of room for two, a condo for one. This tent withstood heavy winds, snow and some rain with no problems. A great product and will use it often in the fall, a little warm and enclosed for the summer months. This is the ultimate budget 2/3-man expedition winter tent. Nothing comes near it until you get up to about $400. It is a simple version of the VE-25 with more room, and I have slept more than 100 nights in them up to 17,000 feet. But it's a big footprint for ledges. I have had two of these since 2000 and both are still going strong. I have owned this tent for a little over a year now. I have owned this tent for a little over a year now. I have used it in warm weather and extremely cold weather. It is not bad without the fly if you are camping in warmer temps (60 and above). With the fly on it gets pretty hot. In cold weather it is extremely warm. It handles rain, snow, and ice extremely well. You will not get wet in this tent -- period. Mine has not been subjected to extremely high winds yet, but I am sure that it can withstand the elements as well as any other expedition tent on the market. There seems to be alot of condensation when camping in temperatures well below freezing. The walls of the tent will be frozen solid in the morning. It could definitely ventilate a little better at extremely low temps, but then again so could every other tent. There is a zippable vent window on top of the tent that actually helps with air flow quite a bit. This tent is a little on the heavy side - almost 11 pounds packed. It is best to split it up between two people, but it is certainly manageable by one (unless you are a die hard minimalist). It is nice to use as a base camp when going on 3-4 day backpacking excursions, but gets a little annoying when carrying it on your pack day after day. I love the size of this tent. Although it is somewhat heavy, it is quite roomy and will sleep 2 people and one large husky with room to spare. It is hard to find a comparable expedition tent with the interior room of this one. The interior side pockets and gear loft are pretty standard, nothing great. The fly is nice, providing two vestibules -- one large and one small. The small one is great for keeping boots and smaller gear while the bigger one is great for storing packs. The poles are great and the mesh sleeves that they slide through are great, creating bombproof sturdiness. 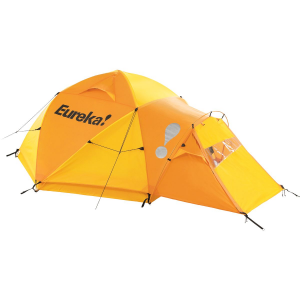 One thing I don't like is the fact that Eureka doesn't make an actual footprint for this tent. They sell what they call a "floor-saver" for about $12 which is a waste of money because they don't even sell it in the right size. They market it for the K2 XT, but it is actually about 8" small on every side. It is also pretty thin plastic. I went to Wal-Mart and purchased some nice, thick drop plastic and cut my own floor saver for about $3. All in all, the K2 XT is a great tent for the price. You can find slightly better tents out there such as the Mountain Hardwear Trango or the Bibler Bombshelter, but you are going to be paying twice as much. I have had my K2-XT for almost three years at this point, but haven't posted a review because I haven't felt that I had challenged its capabilities yet. The first time I used it was in a summer thunderstorm and I had no leaks, no problems with water penetrating the fly, and it was steady in the accompanying wind, but it was new, and I was very careful about setting it up. I have used it sparingly (I have two other Eurekas, a Solitaire, and a Timberline Outfitter 6) but I have tried to get it out into some real weather and just hadn't been able to be out in the kind of storm I've been looking for.......until this past February. I was able to camp in some light snow and reasonably cold weather last winter while skiing, but this year I heard about a storm moving into our area, and headed straight for the mountains. I got the tent up, dinner finished, and everything ready before the wind kicked up and my two dogs and I packed in for the night. For the next 3 to 4 hours the wind blew so hard I thought it might knock down some nearby trees that were still full of snow from the last storm. It felt like the tent, the dogs, and I were going to become an airborne tent saucer...but she held firm. This was followed by rain that quickly turned to snow and piled up over 12 inches by morning. It piled up on the K2, then mostly slid down the sides and piled up around the edges of the fly. The tent was warm with very little condensation (I expected quite a bit with two large dogs and I in the tent), roomy for getting in and out of layered clothing, and the window was very nice for watching the snow accumulate on my exposed ridge. All in all it performed quite well. I don't know how cold it was because my camp thermometer blew away in the wind and was buried under the snow and I lost it, but it froze my 6 gallon water container solid in just a few hours. This is not really a summer tent, but I now feel confident that it can take about anything I might run into in the winter. There is one small annoyance, this being the trade-off between tent tension and ease of set up. I have had trouble with this every single time I set up this tent; the poles that run from the sides of the front door to the sides of the back door are VERY challenging to get into the grommets on the stake out points, even the outer ones. I always prevail, but it isn't easy. The good points, and there are many, include the fact that the four poles that make up the tent frame are all the same length. This really helps at night or in adverse conditions. The set up instructions are right on the inside of the stow bag, but you only need them once. Two doors are handy - not necessary, but handy. Plenty of mesh gear pockets. Plenty of tie down points on the fly. The plastic snap buckles on the fly are handy and effective. Excellent materials and workmanship. Weight of the tent splits up nicely for packing by either two or three hikers -there are three parts, poles (2.0 lb), tent (5.0 .lb), and fly (3.0 lb). I suspect I will have this tent for many years. Roomy for 2. Tight for 3 but will work. I have used it for 4 years. Tested in very high winds at 7500 feet near Jefferson Park and 9500 on Lunch Counter on the way up Mt Adams. Tent is bombproof, no leaks, warm in cold weather. Lunch counter had 3 people in tent outside temp below 0 inside tent warm enough to have sleeping bag open. Not great for summer camping unless doing high alpine climbing. Sliding the poles through the mesh full length slots kind of stinks but not enough to slow down setup too much. My wife and i set it up in about 2 mins. we recently took it camping in the italian alps and got 3 inches of snow in the morning. the temp at 0600 was 25*F and was probably 22-25*F at 0300-0400 with a breeze. some condensation inside the tent even with the top vent open. I stayed very warm and was using a 10 year old army sleeping bag!!! The K2-XT is a great 4 season tent. In the last month I have spent 3 weeks in Southern Alaska; 2 of which have been constant rain. My tent has never leaked. Even when there was over .5"s of water under the tent the floor never leaked. On trips to Western Oklahoma I have weathered storms with sideways rain and winds over 40 miles and hour my tent never leaked or budged. The full length pole sleeve is the only way to go. I have had to make room for friends whose Mountain Hardware clip tents have torn away and collapsed. 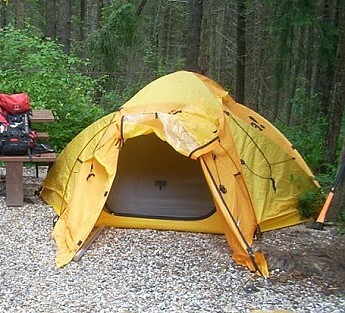 I would prefer that the rainfly extended to the base of the tent and that both vestibules were same size. The single large vestibule is great for dry gear storage. A second large vestibule would be great. 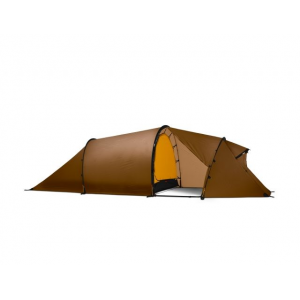 If you are looking for a near bullet proof 4 season this tent deserves strong consideration. The weight is negligible for the peace of mind this tent provides. For 3 years I have used this tent all over Alaska. From almost daily rains in Southern Alaska to the windy snowy mountains in the Brooks Range this tent has been exceptional. Although a little large and heavy for one man expeditions it has been well worth the bulk and added weight. The large vestibules are great for gear storage and cooking. I do recommend carrying a footprint large enough to provide ground cover within the vestibule area. Again, the extra weight is outweighed by the comfort and convenience when you have to spend several days living in your tent. During heavy rains in Cordova the K2 never faltered. The K2's excellent venting helped keep internal moisture and humidity minimal while providing sufficient ventilation to keep the inside comfortable. I prefer to secure the guy out lines even when wind conditions do not require it. It helps shed water and reduces noise from the flailing rainfly. 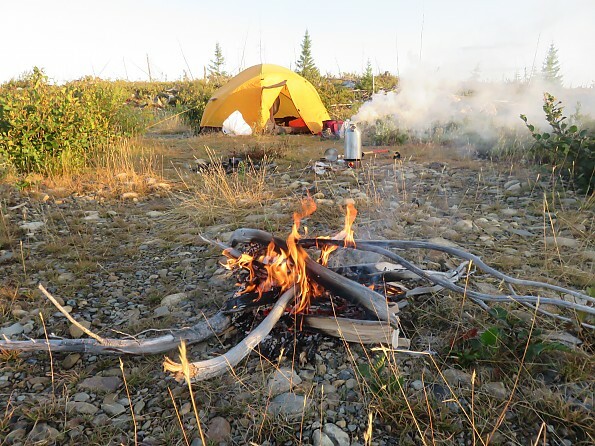 Winter camping with any tent in any of the Alaskan mountain ranges or open tundra can be challenging. The only drawback to solo camping the K2 in winter conditions that can easily drop to 40 below is keeping the inside warm. The large interior space is great for getting all your gear inside but it is hard to warm. A single burner radiant heater does a great job at keeping the interior tolerable. 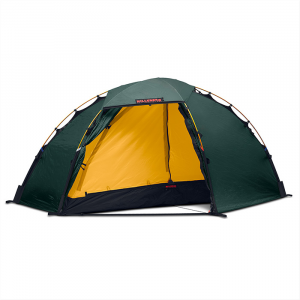 Again, the K2's excellent ventilation is great for escaping fumes caused from cooking inside the tent and the heater. The tent has never given me cause for concern in high winds and heavy snow. Internal frost is not bad and easily manageable. Overall I have been very pleased with the K2. It has always exceeded my expectations and converted many of my travel companions out of their more pricey specialty brand tents. I just received my K-2 and went to set it up out in the yard with my girlfriend. We followed the instructions and found the initial sliding of the poles through the sleeves not terribly easy, kept getting caught. Went to attach the last pole in the grommet and the grommet tore right off. Taking down the tent now with great disappointment met with more frustration of trying to get the poles out with them coming apart while still in the sleeves. Never got to even try the fly on. I can't imagine trying to do this all on a mountain in the wind and cold, it would have been a nightmare, not including the possibility of the breaking grommet up there with no alternative for shelter. Returned the tent and am considering the EV-3 by Mountain Hardwear, lighter and easy set up.